The tail of a 99-million-year-old dinosaur has been discovered in Myanmar, complete with feathers, bones, and soft tissue, RT.com reports. The finding is the very first of its kind, much to the delight of scientists across the globe. The remarkable discovery has roots in 2015, when Lida Xing, a researcher from the China University of Geosciences, was wandering through an amber market in Myanmar, when he came across something that caught his eye. For sale at a stall was a piece of amber that had been dug out of a mine. Inside, he could see some ancient ants, and a fuzzy brown tuft. While the salesman believed the brown object to be some sort of plant, Xing suspected it was much more significant than that – part of a feathered dinosaur. He persuaded the Dexu Institute of Palaeontology to buy the artifact, and began studying it alongside colleagues from China, the UK, and Canada. They soon discovered that Xing was right – the object preserved in amber indeed belonged to a dinosaur. Xing's colleague Ryan McKellar, a palaeontologist at the Royal Saskatchewan Museum in Canada who was involved in the study, said he’s “blown away” by the finding, which is the “first of its kind,” Reuters reported. Their excitement is understandable. 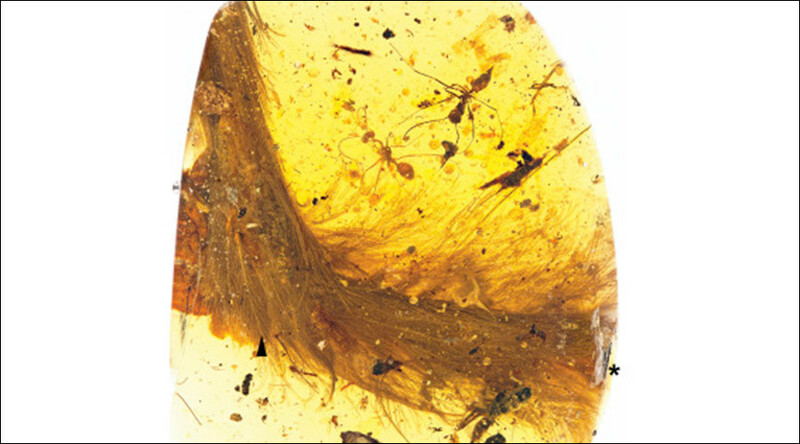 After all, it’s the first time that feathers together with skeletal material from a dinosaur have been found in amber.